So when I fell and skinned a knee, no one came to comfort me. I'd quickly learnto turn and quip, " It doesn't hurt" and bite my lip. So as I grew to reasoned years, I learned to stifle any tears. Though " Be a big boy " it began, quite soon I learnt to " Be a man". And I could play that stoik role while storm and tempest wracked my soul. No pain or setback, could there be could wrest one single tear from me . 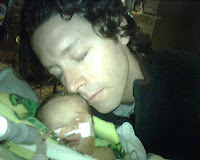 Then one long night , I stood nearby and helplessly watched my son die. And quickly found , to my suprise , that all that tearless talk was lies. And still I cry , and have no shame. I cannot play that " big boy" game. And openly without remorse, I let my sorrow take its course. reach out to him with all your heart as one whose life's been torn apart. For men DO cry when they can see their loss of immortality. And tears will come in endless streams when mindless fate destroys their dreams. Yesterday was Easter and I had know idea the freight train of emotions were coming along with it. The day started out with beautiful weather and high spirits on my part. I began to think that this would have been Trey's first year as an egg hunter and an Easter Basket recipient. That in itself was a little sad but it wasn't until I started seeing the pictures of children, Easter Egg hunts, and Easter baskets that parents were posting that it REALLY hit me. In all of the pictures, everyone was smiling, the kids were having a blast, and everyone looked so wonderful in all of their Spring dress clothes. There were pictures of children with Easter Bunnies and children holding up eggs excitedly as they released them from their hiding places. I saw children dipping eggs into dye and sprinkling glitter all over hard boiled eggs, usually making a HUGE mess, which is often the best part. I have always been aware of the infinitely long list of things I would never get to do with my son, but it takes special occasions like this to create the proof in the pudding. This is the year my husband and I should have been hiding Easter Eggs while the Trey snoozed early in the morning or spent the evening crafting his Easter Basket. I could just see him in khaki shorts, a button up, and his nicest shoes raring to race out to look for the colored treasures hidden in the yard. But, that's all I have, visions of what could have been, what SHOULD have been.. I found myself wondering, while other parents fill their child's Easter baskets, Christmas stockings, Trick-Or-Treat bags, Birthday presents, and Valentine's envelopes, what do parents like me fill? All of he aforementioned totes carry tokens of love, affection, and care. I too have all of those items, yet I have nothing to fill it with. I can't fill it with memories, there are very few to even begin to fill their carrier. Why fill it with toys and gifts that he will never receive? The joy I would normally give to these special occasions is overshadowed by the fact that I cannot and never will share them with Trey. Someone said to me that SURELY he will celebrate all of these special occasions in Heaven with his friends and loved ones, but where does that leave me? While he is in the paradise we call Heaven, I watch as children squeal with delight as they experience these traditions with their loved ones here on Earth. I get to watch other parents get to experience everything I SO looked forward to experiencing with him, yet I get to watch it from the sidelines, like getting called last in sports, everyone else gets to have the fun and joy long before you, even though you KNOW you deserve it just as much. So here I am with my empty "basket". I know I will get to experience all of these wonderful things with our daughter when she is old enough, that will NEVER make it ok that I will never get to experience these wonderful things with Trey. I have lots to look forward to, but in his basket, his stocking, his Trick-Or-Treat bag, his Birthday present, and his Valentine's Day envelope, there will always be a void. I know that in the future as I am sharing these experiences with Lorelei, there will always be someone missing, an older little boy running beside her, helping her find the eggs, reaching up tall to grab her stocking for her, teaching her how to say Trick-Or-Treat, helping her blow out the candles, or drawing his own Valentine just for her. 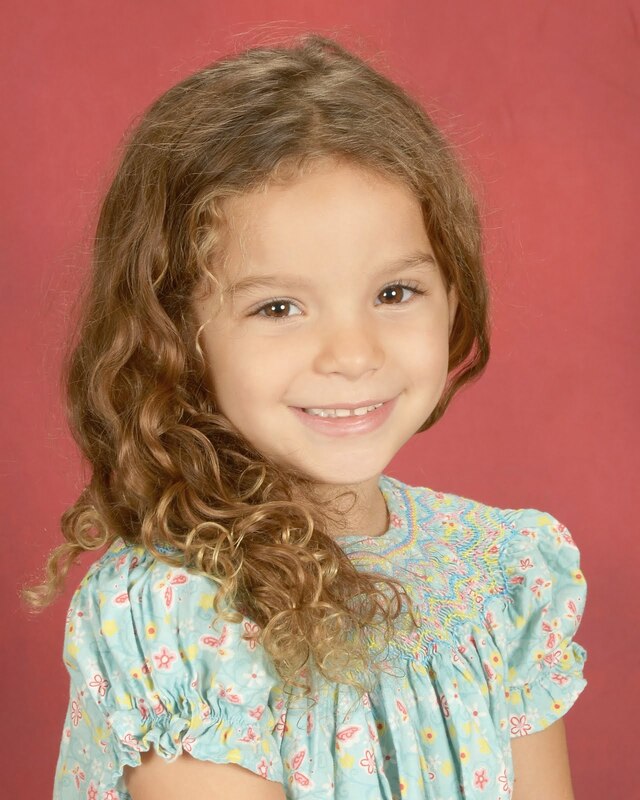 The saddest thing is that she will never know the fulfillment that comes from having her big brother on Earth, to love her and look after her the way I did. On the other hand, one could argue that having a Guardian Angel as a brother is the next best thing. Click on the links below to download Trey's and Lorelei's Soundtracks! Grieving Secrets - SHUT UP!! - SHUT UP!! I wrote this after hearing the insensitive things said to other Angel Mommies and, on occasion, myself. Last night had the most graphic and disturbing dream about losing the baby. In the dream I recognized the signs that I was losing the baby but I REFUSED to believe that it was happening thinking there was no way I was losing another baby. I just kept listening to those near by continuously reassure me that everything was fine. Eventually, despite my denial and the reassurance of those around me, in the dream she died. The dream was so disturbing that I woke up, sitting straight up in bed panting. But I woke up and it was only a dream, thankfully. This morning I woke up relieved to be done with the nightmare and ready to munch on the breakfast my husband brings to me every morning. After I finished eating, I snuggled up to my husband and watched the morning news expecting to feel the movement of the baby that I ALWAYS felt within five minutes of eating. It didn't come as expected and I started to panic. 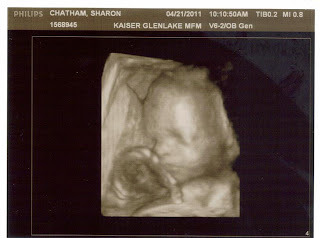 In the wake of my devastating dream, I became desperate to feel some movement from our unborn daughter. I tried all the tricks to no avail and by the time I was ready to leave for work, I was a blubbering mess, thinking of all the worst reasons why she wouldn't be moving. I worried that I didn't sleep on my left side like "they" said I should or that I instinctively did not awake when the baby was in trouble. Luckily, after apparently sleeping in this morning, Lorelei said hello with a kick along with some other movements on my way to work. This did not TOTALLY ease my anxiety, I begged her to kick the hell out of me all day so I would be constantly reassured throughout the day that she was just fine. Of course she moved when she was good and ready and slowly throughout the day, my fears were put at ease. I got to thinking about the kick counts I am supposed to be doing at this point in the pregnancy. This is the time when the baby's growth is maximized and the space in the belly becomes diminished so movement at times can be limited due to their being no elbow room. As if this morning did not unnerve me enough, they want me to count kicks when the schedule of movement I have become accustomed to is slowly becoming extinct? Talk about asking for a nervous breakdown! I don't ever remember being so focused on kicks when I was pregnant with Trey, let alone kick counts. Oh, I paid attention to his kicks, being pregnant for the first time they were more fascinating than anything, yet I did not connect them as vital signs, just as wonders of pregnancy. This time around, I am like Pavlov's dog, anticipating the next round of movement based on the schedule of movement that I have become accustomed to, all that's missing is the bell and the slobber. It seems like every time I feel like I can relax and enjoy this pregnancy, something knocks me upside the head and I am back to worrying. Yet isn't that a side effect of parenthood? You get to a point where you can put your feet up and relax when something beckons and you're back in the game rolling with the punches. My husband and I should be plenty use to the ebb and flow of parenting, yet our version of parenthood is rather unconventional. It feels like we are starting over this time around which is an unnatural, almost alien, feeling. For now I am glad I woke from that nightmare, made it through the day, and acted as the soccer goal for my daughters movements. I didn't use to be this hypersensitive, not entirely anyway, and I hate feeling this way. I would love to live footloose and fancy free the way we did with Trey's pregnancy, but once you've been through the storm of child loss, you're more eager and desperate to batten down the hatches and hide in the basement even when the sun is still shining. As I sit here, listening to the Spring storms brewing outside, I can only hope for respite from the storms rumbling from within my heart and soul. 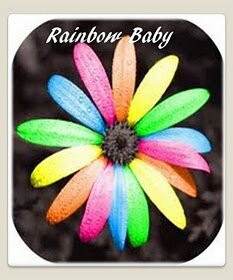 Then, my rainbow will come, in the form of a healthy baby girl! AND SO MUCH MORE! Such a wonderful resource! Like broken glass under our feet. The life we dreamed is gone away. And half of me died too, that day. My hollow eyes must say it all. I’m not the same since you answered God’s call. 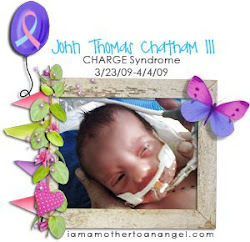 I have always heard that the 2nd Birthday and Angelversary of an Angel Baby are harder than the first. What I have learned over the past two weeks is that these special Angel Dates, like mourning, effect us each individually, in different ways. I had long dreaded this time period of the year as I did last year, but was surprised to find that I got through the nearly two weeks between Trey's Birthday and Angelversary unscathed, well almost. The Monday before his birthday I asked Trey for strength to get through the hard days ahead and BOY did he deliver!!! With only two meltdowns (inspired by beautiful, healing words of song), I consider the passing of this difficult time a success. I started off the month kicking off a service project for Trey's 2nd birthday in which we donated and collected teddy bears for an Angel Mommy who has done SO much to help her NICU and Angel family community. Angel Ella's maman (mom in french) Yolaine and I formed a friendship after the passing of our children and from the get go I felt that we were meant to be life long friends, as were our angels. 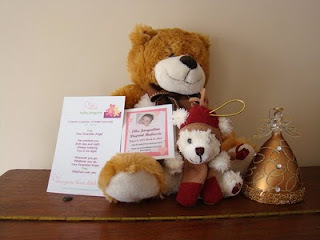 My Canadian friend sent me the ELLAs Teddy Bear Care Package (pictured above) towards the beginning of the month which included a medium sized bear, mini bear, beautiful angel, and blessings from Angel Ella. 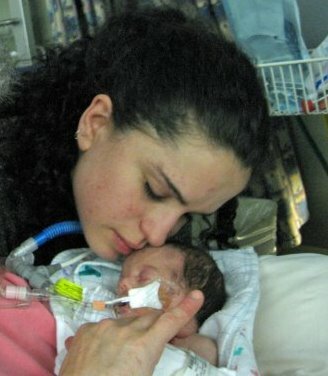 It was a beautiful blessing from an angel in heaven and her maman, an Earthly Angel. 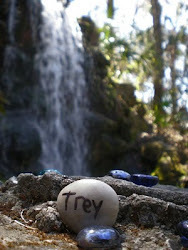 Receiving that package confirmed for me that our service project was the PERFECT tribute to Trey on his birthday. 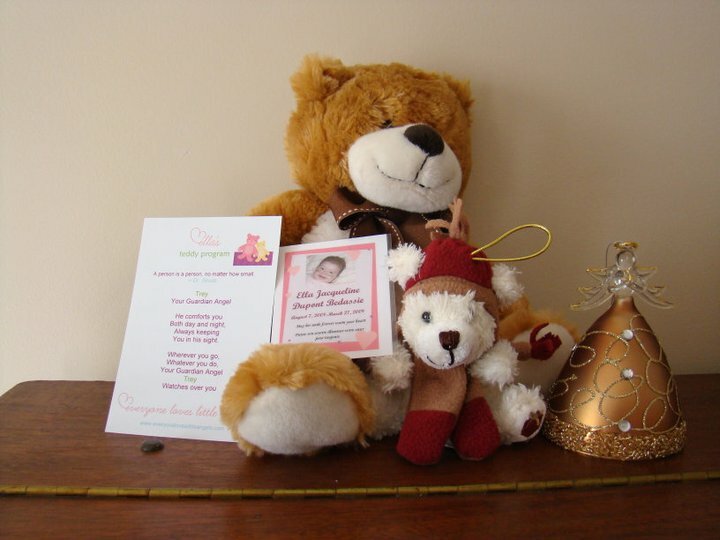 Shortly after Trey's 2nd birthday I was pleased to find out that 49 bears were donated and sent up to Yolaine to be contributed to her charity that supports NICU and Angel Families. 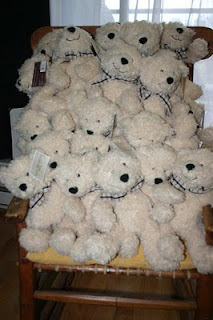 Of course, I would rather have enough bears sent up to the point where she would never have to worry about collecting bears again, but in the grand scheme of things, 49 families were comforted due to our efforts and those of my loved ones so I was very proud!! 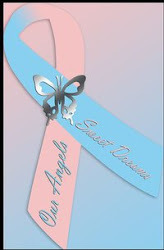 On Trey's Angelversary, I was comforted to be informed that the same day Trey earned his wings was the day that Ella's family, caregivers, and friends were honoring her life in ceremony, and, as her maman says, she waited on her pink cloud to welcome her new ABFF (Angel Best Friend Forever) to Heaven. What a comfort to know that not only did he have family and other loved ones waiting to receive him, but new friends as well. I believe that Ella and Trey are forever entwined in friendship, love, courage, and strength, as are her maman and I. We were honored to be a part of ELLAs Teddy Program! Speaking of stuffed animals, while Trey was in the NICU we were encouraged to sleep with his smaller stuffed animals to get our scents on them. We would then bring them to the NICU and leave them with him so he was able to feel our presence even when we weren't there. After his passing, the practice of sleeping with his stuffed animals never really ended, especially for two of our favorite of his stuffed animals. When I was pregnant with Trey, people were giving us stuffed animals along with other toys for our him. 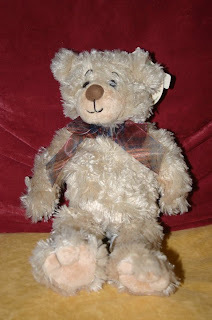 I encouraged my husband to choose a stuffed animal of his own to give to his son as I had already done. 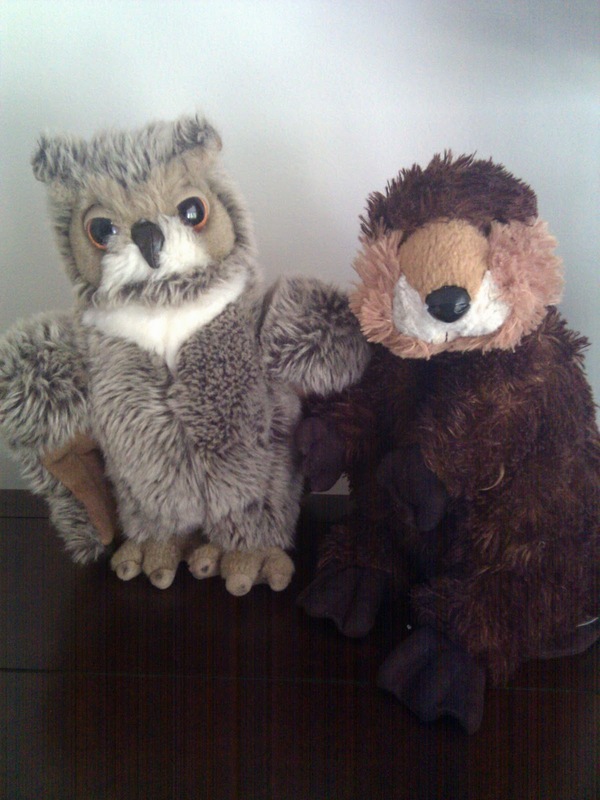 Low and behold, not long after that request a package came to our home with two stuffed animals in it: a beaver and an owl. Perplexed, I asked my husband to share his "inspiration" upon choosing those two animals and he explained that those animals represented the mascots of two Ivy League schools he was hoping that Trey would get into. 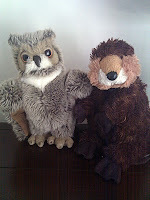 I appreciated his "outside the box" thinking, never knowing how much of a role those two stuffed animals which we named Logger (the beaver) and Bartlebee (the owl) would play in our lives in the next two years. Sleeping with those two animals was like having little pieces of him with us while we slept, it was comforting in a way I am not sure either of us could ever explain. 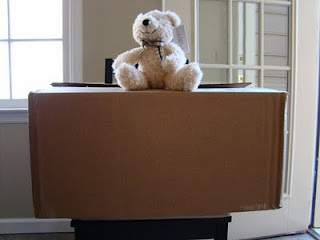 In the days leading up to Trey's Angelversary, I got to thinking about the two stuffed animals we had slept with for two years and what their role would be once the new baby gets here and for the rest of our lives. It occurred to me that these animals were gifts to Trey from his Daddy and everything else that Trey was given (with exception of the "boy" stuff) had already been given a permanent home in the nursery for Lorelei and maybe these stuffed animals needed to be turned over to her as well. So on the eve of his Angelversary, I slept with our two stuffed animal friends for one last time and the next morning I placed them in the nursery, ready for Lorelei. That night I began sleeping with the larger of the two bears that we received from Angel Ella and her maman whom I named "Ange" which is angel in French. He was a gift given to US for our healing and comfort so the transition from Trey's stuffed animals to "Ange" was pretty seamless. I still felt as though I had a piece of my little boy with me while I slept, but added to it was the love of many more angels looking down on us as well as my Earthly Angel friend Yolaine! The day before Trey's Angelversary, John and I celebrated our 6th Wedding Anniversary. We didn't do anything extravagant, just the exchanging of gifts and sweet sentiments. I was reminded of our 4th Anniversary two years ago in which we stood on the back deck and weighed Trey's options and decided to allow him to earn his wings. We were encouraged that day not to sign anything papers or make that the day we released him to Heaven lest our Anniversary would also be Trey's Angel Day and we would not enjoy an Anniversary for a long time to come. Despite the fact that we took the advice and waited until the next day, I think EVERY Anniversary will forever be in the shadow of the day that follows. That's not to say that we will not celebrate and honor our Anniversary, but I am sure my husband had the same thoughts that I did throughout our day of "celebration", "today is a beautiful, wonderful day, but what will tomorrow bring and how will I get through it?" That day, our love and recognition of our special day were not lessened, our minds and parts of our hearts were preoccupied. The back to back special days came and went, blessed with beautiful weather and peace in our hearts. I planned to spend his Angelversary soaking up the sun and enjoying the beautiful day. Instead, after a while of soaking up the sun, I gave in to my body's desire to nap and, with windows and doors wide open as to enjoy the Spring air, I let the moderate winds lull me to sleep for most of the afternoon. The ironic thing was that I have always associated the wind with Trey, like he floats in the wind and flows in and around me! So having the wind blowing that day was an added blessing to the peace that surrounded us throughout the day! I wish EVERY Angel Family that kind of peace on their angel's special days. 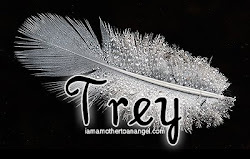 Throughout the nearly two weeks between Trey's Birthday and his Angelversary, instead of updating my blog with my daily reflections, I worked tirelessly on adding resources for Angel Families, poems, articles, and anything else I could find that would enhance the blog and also help other Angel Families. 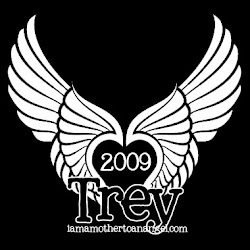 I created a page to list Trey's Angel Friends along with their special days and websites. 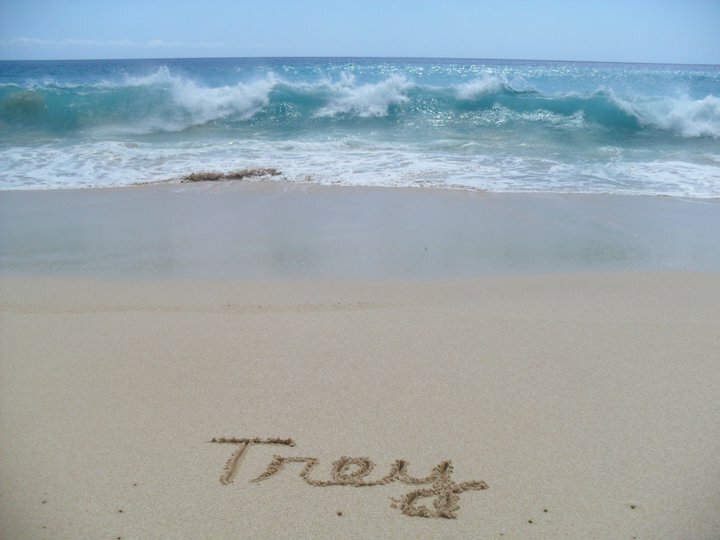 We were able to get two organizations to write Trey's name in the sands of beaches in Hawaii and Australia, the one in Australia was created on his Angelversary. It warmed my heart to be able to do something positive and helpful in the wake of these difficult days, it definitely made the days more enjoyable. All in all, the days passed peacefully with limited sorrow but as I said before, we got through unscathed, ALMOST. After nearly two weeks of having my chin held high, the bottom was bound to fall out. Just when I thought I was in the clear, last night brought "the murk" back with a vengeance. Yesterday itself was SPLENDID! I had lunch with a new Angel Mommy friend and later met up with another Angel Mommy Friend. It's always a bittersweet therapy session when getting together with other Angel Mommies, DEFINITELY more sweet than bitter. It's practically the only time in which an Angel Mommy can bare her sole to someone with no judgement and every bit of support and empathy that one could ever encounter. Yet often times, these encounters open up the flood gates of emotions, memories, and feelings. Both encounters that day were EXTREMELY beneficial and soul soothing, yet laying in bed last night reading a book that centered around a woman's struggle with Cancer, my mind started a painful emotional loop. Knowing this character's eventual fate, my heart and mind reverted back to Trey's struggle with CHARGE and his eventual passing. I began a slow spiral of panic stricken thinking and worrying about the baby I am carrying. I started thinking about the ugly realities of life that my husband and I, along with other Angel Parents, know all too well, that ANYTHING can happen between now and the birth of this little girl even though we hope, wish, and pray that the outcome is favorable to us. I know from my experience and the experiences of my Angel Mommy Friends just about every possible outcome to our pregnancy, both joyous and tragic. My heart ached at the notion of having to go through what we went through losing Trey again with our precious little girl! Daily, with all my heart and soul I plead with God not take this baby away from us too and I hold onto as much hope and faith as I can that this time it will be different. I was told once that these negative thoughts and feelings are the devil getting to me, but I have to whole heartedly disagree. The thoughts, feelings, and fears are the NASTY residue of child loss that NOTHING can ever remove. I feel like I will forever be wrestling with the fear that something will happen to my child(ren) and they will be taken away from us again. I will forever be fighting to keep these thoughts at bay and seeing through the fog of doubt and fear that losing a child brings with it. It's hard for most to understand unless they too have lost a child. One can show the greatest of strength in the face of loss, but their are times when that strength is tested and last night was one of those times. I am incredibly grateful for my peaceful days in the past few weeks that I thought would be so hard. I also am strangely grateful for hard times like I had last night. It's those hard times that allow us to release feelings and emotions, keeping them from eating us alive and helping us pick ourselves back up can carry on. This delicate balance is essential to ANY type of healing, it's never easy, but in the end we walk a little taller in strength and love. We don't know what the future brings and we have no control over it, but I will continue to draw from the on-going courage and strength of our son. I will strive to enjoy EVERY moment we have with our daughter trying to keep the worry and fear at bay in the mean time. 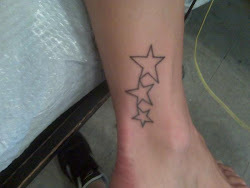 But for now, I will look to the future with hope, faith, love, and strength surrounding me and hopefully sustaining me! EXHALE! 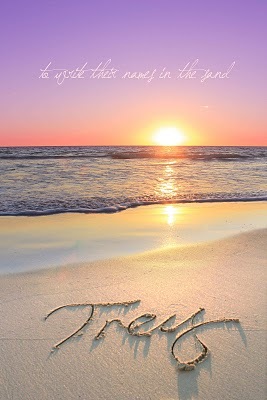 A Special thank you to "To Write Their Names In the Sand" who captured Trey's name on Christian's beach in Australia at sunset on his 2nd Angelversary. 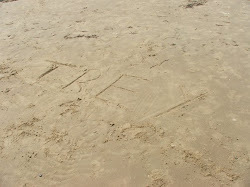 The link below will allow you to view Trey's ENTIRE memorial sunset photo and Angel information. So sweet! Today is our son Trey's 2nd Angelversary in Heaven. We miss him and love him more than we could ever say. With that said, we just KNOW he's the cutest Cherub in Heaven playing at the feet of Jesus. He will ALWAYS be a member of our family and hold a special place in our hearts. His short life left a LONG legacy of strength, courage, and love. Thank you son for being our inspiration and our Guardian Angel! I would like to wish a Happy International Mother's Day to my Angel Mommy Friends across the world! ...My little boy never will. My little boy can already fly! 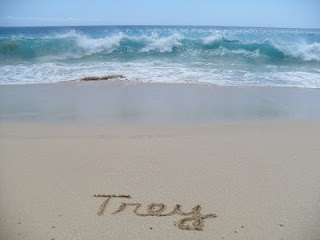 Every time I hear this song I think of my Angel Trey! Love you son! 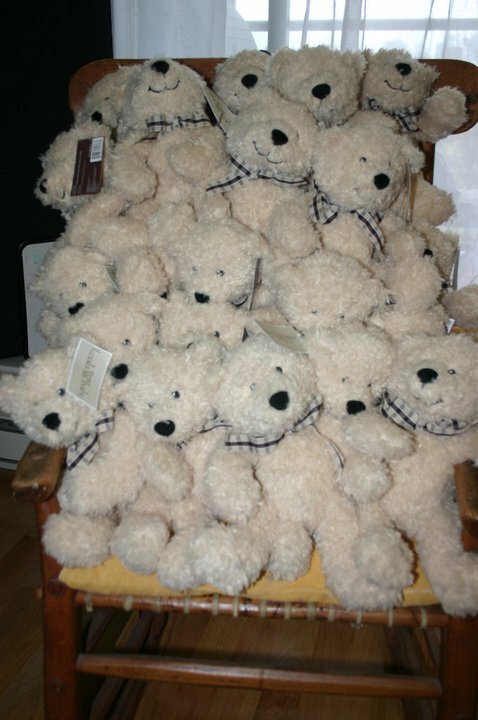 We are so EXCITED to announce that during the month of March we ordered 37 bears to be donated to ELLA's Teddy Program as donated by John and I as well as our family and friends. Add to that the 3 that were sent individually by our loved ones and the 9 that I ordered today! 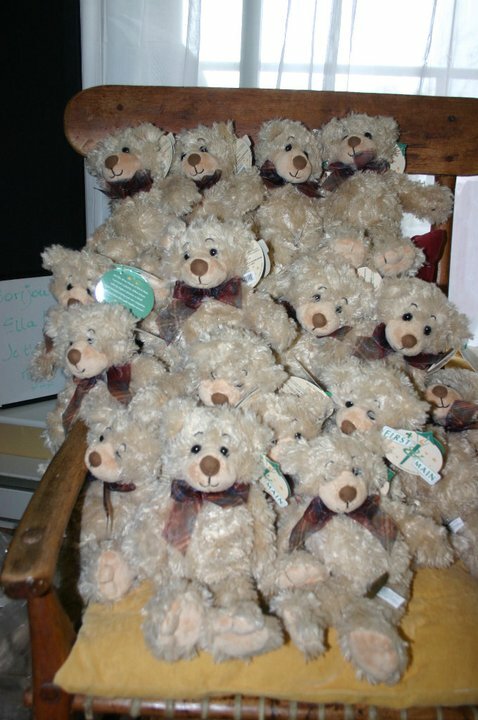 That's a grand total of 49 teddy bears donated to help Angel Parents and NICU Parents! THANKS SO MUCH to those who donated to money and/ or sent bears up to Ella's Maman. 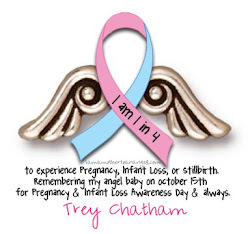 I can only imagine how proud our Angel Trey is of all of your efforts to help his Angel Friend Ella and her Maman. Thank you SO SO SO much again! 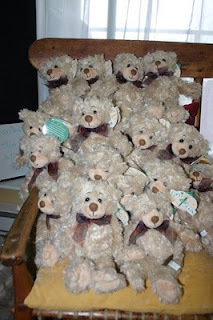 One 20 bears that John and I donated. The box of bears John and I donated. 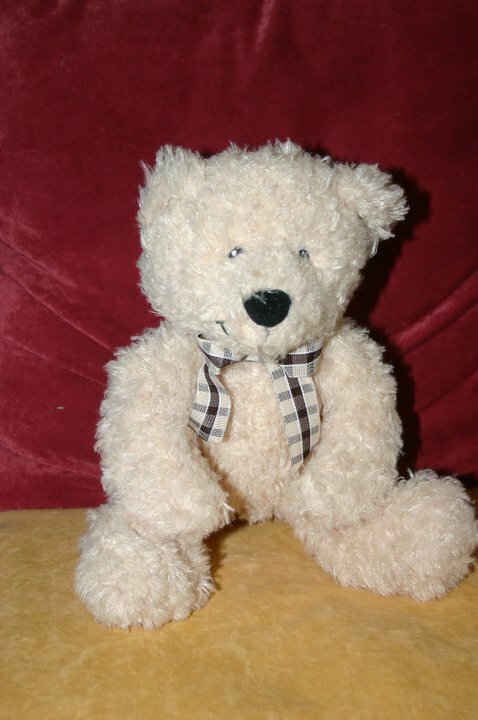 One of the second set of bears donated by our loved ones. 2nd set of 17 bears. 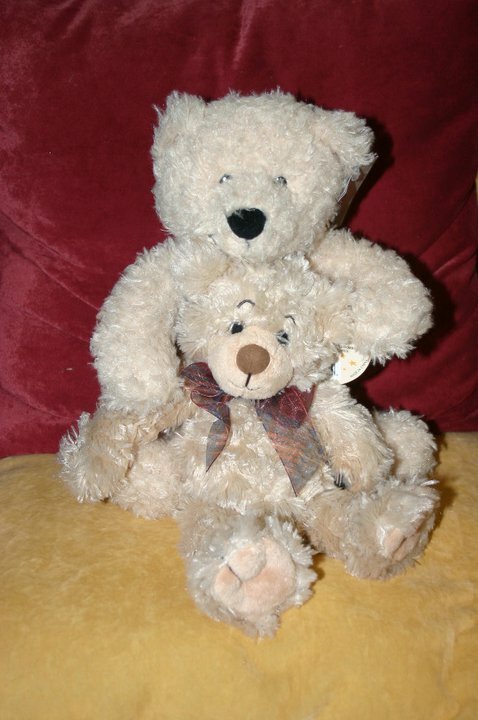 Both types of bears together! "I know how you feel. Because my mother tried again!"